One percent of physicians accounted for approximately one-third of paid claims, and proneness to malpractice claims varied by specialty and increased with prior history of malpractice claims. Although 84% of physicians that paid claims incurred only one from 2005 to 2014, those who had six paid claims had a 79% chance of another within 4 years. WBB Take: Malpractice claims are a disruptive nightmare for providers, and the chances are that every provider will experience this firsthand at some point in their career. 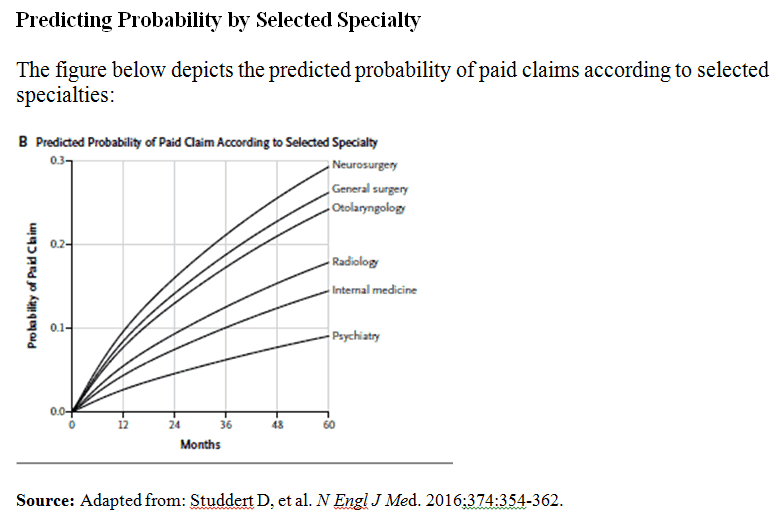 However, the probability of a malpractice claim is not evenly distributed, and some providers are far more likely to have claims made against them for malpractice than others. Proneness to malpractice claims can be reduced through quality improvement approaches, and practices can take proactive steps with quality improvement to greatly reduce the likelihood of malpractice claims. A good first step is to look at “near-misses” in which patients complained but did not litigate, as well as any claims that were made. There are likely to be far more “near-misses” than paid claims, and these can be the basis for root cause analysis. Using the Ishikawa “Fish Bone” ” analysis in conjunction with the “Five why’s” and a “5S” cleanup of the environment can be a solid start to reducing risk of malpractice claims.